Review by AllTheBestFights.com: 2016-07-30, close and exciting fight between Leo Santa Cruz and Carl Frampton: it is close to to get four stars! Both undefeated, the world champion in three different weight classes Leo Santa Cruz entered this fight with a professional boxing record of 32-0-1 (18 knockouts) and he is ranked as the No.1 featherweight in the world while his opponent, the former Ibf and Wba super-Bw champion Carl Frampton, has a perfect record of 22-0-0 (14 knockouts) and he entered as the No.1 super bantamweight. Santa Cruz won the Wba belt last year against Abner Mares (=Santa Cruz vs Mares) and he defended it once in 2016 beating Kiko Martinez in five rounds (Fight of the Year candidate, Santa Cruz vs Martinez) while Frampton, who defeated Martinez twice, by tko in nine rounds in 2013 (=Frampton vs Martinez I) and by unanimous decision in 2014 (=Martinez vs Frampton II), comes off the victory over Scott Quigg (=Frampton vs Quigg). 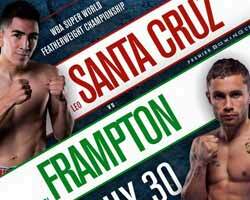 ‘El Terremoto’ Santa Cruz vs Frampton is valid for the WBA Super World featherweight title (Santa Cruz’s second defense). Watch the video and rate this fight!